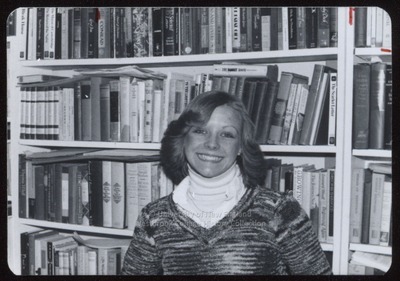 "Student in the Library Stacks, Westbrook College, 1970s"
A Westbrook College student stands with her back to the Library bookshelves in this 1970s black and white snapshot. The young woman wears a variegated yarn sweater over a white turtle neck jersey. Her light colored hair is feather cut and brushed back on the sides.